Cordless microscopes, sometimes referred to as field microscopes, are great tools for use in countries where electricity is limited, for performing work out in the field, or when using a microscope in a room that does not have an outlet handy. When teaching small children it is often nice to be able to use a microscope that does not have a cord connected to it, simply because children can trip on the cord or are more likely to knock the microscope off the table if the cord gets caught on something. 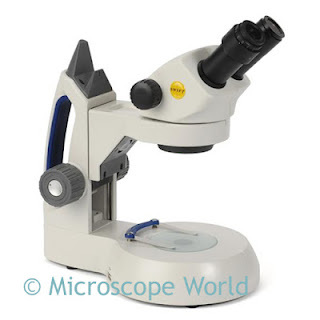 There are several types of cordless microscopes including stereo microscopes, biological microscopes and shop microscopes. Cordless stereo dissecting microscope Swift 101. Shop microscopes are cordless and have an attached pen light for illumination. 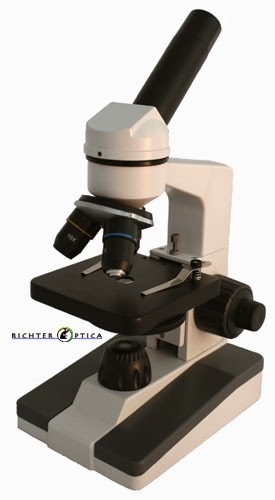 The microscope offers a single magnification (your choice of 20x, 40x, 60x or 100x) and a built-in measuring eyepiece reticle. This reticle imposes a ruler directly on the image you view through the shop microscope. 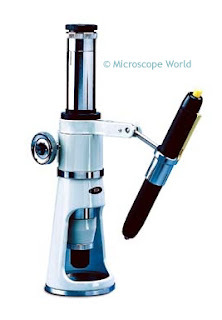 Shop microscopes are typically used by tool makers or for viewing the quality of textiles. Most cordless microscopes run on rechargeable batteries and can be operating while the microscope is charging. There are a few that still work with disposable batteries. If you are in the market for a cordless microscope be sure you figure out which type of battery you prefer prior to purchasing the cordless microscope.